Learning to live with a camera, indeed! I often feel, with a camera around my neck, like I’ve adorned myself with a billboard. Everyone knows I’m a wannabe photog. That, itself, seems to bring certain expectations with it, at least here in America. And now, with camera phones so prevalent, it seems that lugging a DSLR is even more of a statement. People often ask me if I’m getting good shots. I never know how to respond and I suspect they expect me to show them some stunners. I usually stammer that I’m trying… Photography is more than the nuts and bolts of the camera or the elements of style, as you often point out. It is also about being comfortable in one’s own skin. When people ask if you are getting good shots just because you carry a DSLR, just tell them that the camera isn’t what makes good photos. It’s kind of a question that feels blindfolded (or maybe is’s the people asking the question). Photography is certainly about being somewhat comfortable, in one way or the other. But it’s also about pushing oneself outside of the box. I am terrified of street photography. I love to see what others have shot, but It’s impossible to approach someone. Your workshop sounds like a good way to get over that. 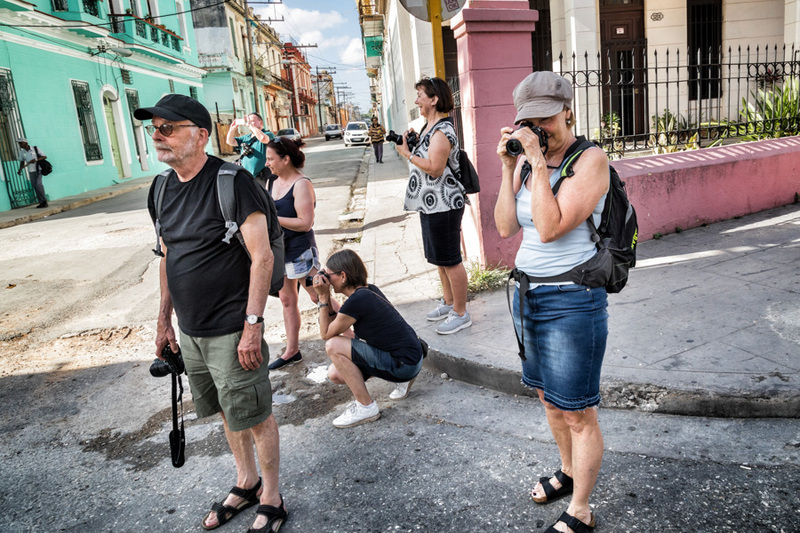 My workshop – or just go to Cuba. 🙂 And you will see that nothing is impossible. Amazing how it looks so natural. And yes photographing people I sometimes feel like I’m intruding on their space. It’s different in other countries, isn’t it? It’s really different from one country to the next. But once you have see for yourself that it is possible, it will be easier in any country thereafter. Great shots as always Otto, and how good to hear your workshop participants gained in confidence so much. I hope that’s always one of the things they can take away from one of our or my workshops. I learnt something through reading this. I am always checking my preview screen, I will try and leave it alone a bit now. good advice and Cuba looks an interesting place. I think you will find you get more into the shooting situation when you don’t have to check the screen all the time. And, yes, Cuba is an interesting place. 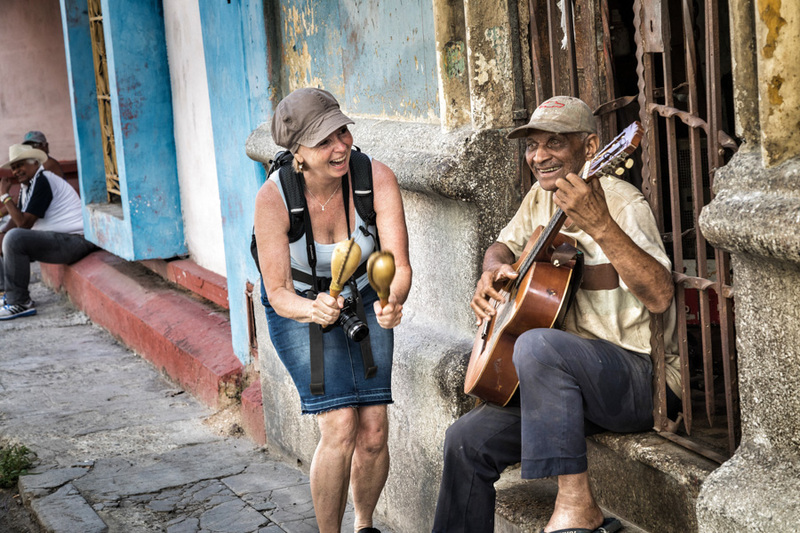 “When participants start to play along with Cuban music or dancing on the street, we are far beyond the pure photographic experience. We talk about life in all its beauty and richness.” How fortunate your students were to have this experience! I expect they came home as much better, more confident photographers — and as happier human beings, too. Just wonderful, Otto. It’s always hard to measure in terms of better, but I do hope—and think—they learned much during the workshop as well as gained confidence. Fun series of images, Otto. Your workshop sounds like fun too. And maybe hard work. 🙂 I am terrible at street photography, mostly because I don’t push myself to do it. I did once, in New Orleans, where the people are so friendly that I wasn’t afraid to ask. See, it’s partly about finding the right places to start with street photography. And, yes, you are right, a workshop is a lot of work—but also very fun and rewarding for both teachers and participants. Oh I’m green with envy 🙂 looks wonderful. It really seems you all had a fantastic experience! Which is already y something great. And if than you also got some good picture even better. I agree. A good experience and good photos at the same time, is a good combination. 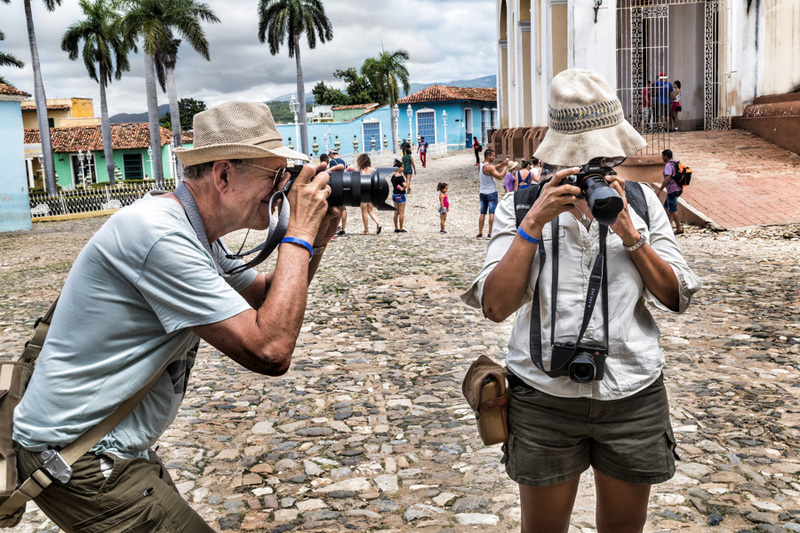 I know of a woman that took a course in Cuba, got over her shyness, thanks to the casualness of the Cuban people and now takes amazing street photography. People are having fun in these photos and taking pic of each other as well as the locals. Interesting process. I like the shot of the participants checking out each other’s work and the woman playing maracas with the guitarist. I am glad you like. Thank you for the comment, Jane. I just love that third photo! The look, the grin, you captured on that man’s face is priceless. Terrific! Yet as for not checking my photos as I’m shooting them — wow, that would be a challenge. I’m just not able to trust myself that far yet (I’m shooting in manual mode). But it’s a great goal, and I’ll have to think about it. Of course it’s easier for the old garde, like me, who grew up with shooting film. Back then there was no checking the result whatsoever. As always, such excellent advise. This workshop and your philosophy towards guiding your students was a delight to read. I do look forward to my next workshop. It’s really a lot of fun. It’s challenging, yes, for both teachers and students, but also very rewarding. Thank you for the lovely comment, Di. I can so understand it’s very rewarding Otto. You’re very welcome, re- my comments. ‘Don’t look at the camera preview’, I so agree with that. Must admit that the idea of street photography and approaching strangers makes me uncomfortable, maybe because I haven’t done it enough. Something to work on. You’re most probably right there. I like the photo of the woman with the marrocas best. I can imagine your happy students wandering the streets and having experiences they’ll carry with them for the rest of their lives. Congrats to you and Sven for spreading fun and knowledge! Thank you, Linda. This was indeed a precious and joyous moment. The Cuban workshop was clearly a great success for all concerned. The photos you have posted are both revealing and uplifting – they instinctively brought a smile to my face! Good to read. Thank you, Louis. What an uplifting and amazing story, Otto. Street photography terrifies me… the thought of walking up to a complete stranger in the street and asking to take their photo makes my stomach tight with fear. Even when it comes to photographic military parades and memorial services, where I often do know many of the people involved, I get really nervous before I work up the courage to approach them and ask if they would like a photo as a memento of the parade. But in that situation it isn’t quite the same as the kind of street photography you’re doing here – because I usually try to give them the photos afterwards. I presume here you don’t do that, right? Your description above was wonderful, and so uplifting… I’m pleased you have found such a lovely way of teaching, Otto. Sometimes I end up giving, or sending, people I meet on the street and photograph, some of the photos I have captured. It really depends on the situation whether it’s just a quick happening or we end up having a longer exchange. Online rarely, I never know what surprises await in cyberspace. Today presented disturbing news from ‘home’ in Mississippi about some tragic deaths… and then Life presented this refreshing post! Otto, those images made my heart smile!!!! I will read the post when at home, but even without words, it’s a powerful pictorial! Thank you for the smile you place in my heart! I am always happy when I can trigger a smile. But yes, the news from Mississippi is very sad. Amazing! I love how YOUR photos tell the story – the first view of the photographers clustered together on the side of the action, and the one near the end where the camera is forgotten and the photographer captures images of the soul, playing music with the subject – lost in the beauty of the moment and of life. Art at its very best. Thank you for opening up this way of seeing and creating to me! I am only happy to open the doors. Thank you for your lovely words, Colleen. We should let go a lot more, I think. 🙂 Thanks for the good comment, Solveig. What a beautiful post, Otto. To see participants relax and live into the moment is inspiring. I will never forget an assignment in a street photography workshop where we had to ask people if we could photograph them. The first person I asked flatly replied, “No”. I found it to be very intimidating. What a positive experience in Cuba. I love your advice to forget about checking your screen- I agree, it breaks your concentration and involvement in the scene. Excellent information, as always. Thanks. Your experience is not the best start of a street photography workshop, unfortunately. But I hope the answer didn’t discourage you from continue. Not at all, however, I find I’m often more comfortable shooting from the hip or other stealthy methods. Very different experience than interacting which is certainly a richer experience. I love that third shot Otto – is that Sven? Besides the fun of the tow people, the street and blue buildings are a great backdrop. Your words are very wise, stemming from years of experience. The next workshop sounds very cool! I hope the next one is going to be cool. 🙂 A by the way, it’s not Sven in the third photo, but a participant. Wow! A photo workshop sounds like so much fun, Otto! 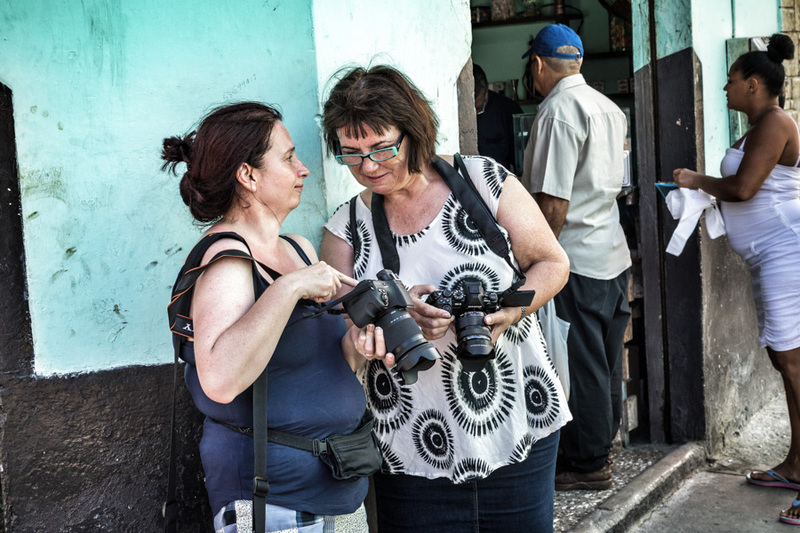 I would love to cross Cuba off my bucket list soon and that workshop is an additional reason to do it sooner. And late autumn sounds perfect for that! I need to follow your suggestion and avoid looking at the preview, I have lost many a good image because I was distracted! Street photography puts me right out of my comfort zone 🙂 How exciting for your students .. they look like they were having a great time! Out of comfort zone is good. 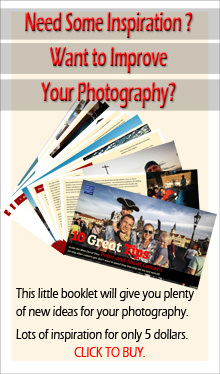 It’s a way to develop your photography and yourself. And, yes, we did all have a great time. Thank you, Julie. What a truly wonderful experience for everyone involved in the workshop, Otto! Thank you so much for sharing the experience and the wonderful photographs here. Thank you, for the comment, Lisa. Have a wonderful weekend yourself. The best and easiest would be the city you live in and then pick a street corner or a place with lots of activity. A street fair or something like that is always easier than “regular” street life. How I envy these folks! There is nothing like having an adventure in another country when one of the participants is a camera. You have given them quite a gift with their memories of the experience. I love to see great street photography, but prefer to ‘shoot’ birds…approaching them is much easier although they do not always agree to be photographed 🙂 Your workshop seems to have been a great success! 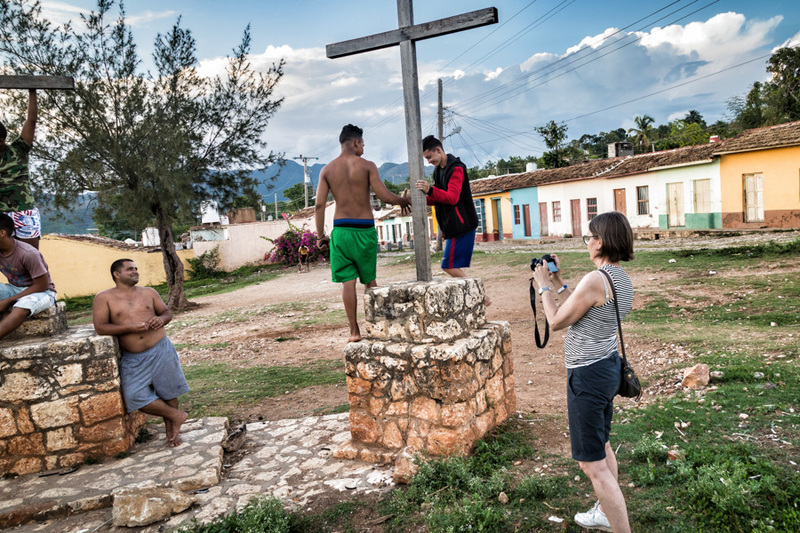 Apparently Cubans are friendly and hospitable people and a blessing for street photography. As I can see you had a great time in Cuba. 🙂 I have to admit that I also make the mistake of checking it in the preview screen after having taken a photo. Because if I don’t like the photo, I can erase it immediately to save space on the memory card. But then the disadvantage is, as you say, that you may miss out on many unexpected good chances for better images! I would say that if you need to save space on the memory card while shooting, you might have too small of a memory card. Anyway, I did have a great time in Cuba—as I always do. Thank you for the comment, Heidi. 32 GB, is that small? And I usually have spare memory cards with me. But I also take a lot of photos! I just can’t stop and soon I made more than a thousand pictures by the end of the trip. There is also no limit with digital photography. 🙂 And I don’t do it only to save space on my memory card, but also to save time at home if I have to select and sort my photos for storage in my files. Thank you for the suggestion and you are absolutely right that we will miss opportunities if we are too busy checking! But I didn’t know that deleting a photo on the memory card could cause damage or cause a malfunction while shooting! Thanks for the warning!